The InterCity 225 is an electric high speed train in the United Kingdom, comprising a Class 91 electric locomotive, nine Mark 4 coaches and a Driving Van Trailer (DVT). The Class 91 locomotives were built by British Rail Engineering Limited's Crewe Works as a spin-off from the Advanced Passenger Train project, which was abandoned during the 1980s, whilst the coaches and DVT were constructed by Metro Cammell in Birmingham and Breda (under sub-contract) in Italy, again borrowing heavily from the Advanced Passenger Train. The trains were designed to operate at up to 140 mph (225 km/h) in regular service, but are limited to 125 mph (200 km/h) principally due to a lack of cab signalling and the limitations of the current overhead line equipment. They are used on services from London King's Cross to Newark North Gate, Doncaster, Leeds, Bradford Forster Square, Skipton, York, Newcastle, Edinburgh Waverley and Glasgow Central. The InterCity 225 entered service with British Rail on the East Coast Main Line in 1989. The units also operate on a small section of the West Coast Main Line (WCML) between Carstairs and Glasgow. When the line north of Newcastle is closed, they are hauled by diesel locomotive to Carlisle via the Tyne Valley line from where they operate north via the WCML under their own power. In 1996, as part of the privatisation of British Rail, all InterCity 225s were sold to Eversholt Rail Group, which currently leases them to London North Eastern Railway (LNER). The InterCity 225 has a top service speed of 140 mph (225 km/h); during a test run in 1989 on Stoke Bank between Peterborough and Grantham an Intercity 225 reached 162 mph (260.7 km/h). However, except on High Speed 1, which is equipped with cab signalling, British signalling does not allow trains to exceed 125 mph (201 km/h) in regular service, due to the impracticality of correctly observing lineside signals at high speed. 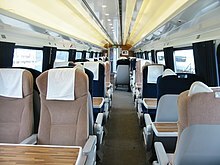 Between 2001 and April 2006, HSBC Rail funded with support from GNER, Bombardier Transportation, Alstom and others a complete rebuilding and refurbishment programme for both the Class 91 and Mark 4 coaches, called Project Mallard. The total numbers of seats are 406 Standard and 129 First, giving the train an overall capacity of 535 seats. As part of the Intercity Express Programme, 30 nine-car electric trains are to replace Intercity 225 sets by 2020. Although it originally envisaged all InterCity 225 would be withdrawn by 2020, in May 2016 Virgin Trains East Coast was awarded extra paths for London to Edinburgh services that will see a fleet of six to eight trains retained. In June 2017, Great North Western Railway announced it planned to use InterCity 225s on its proposed London Euston to Blackpool North WCML services .Also 12 Mark 4 coaches are going to KeolisAmey Wales to replace their Mark 3 coaches. ^ "The Design and Development of the Class 91 Locomotive", P J Donnison and G R West, Main Line Railway Electrification Conference 1989 - Proceedings of the Institute of Electrical Engineers, 1989. ^ "The design, manufacture and assembly of the British Rail Class 91, 25 kV 225 km/h locomotive", M L Broom and G W Smart, Proceedings of the Institute of Mechanical Engineers Vol. 205, 1990. ^ a b "Back to the future as history made with east coast rail icons". National Railway Museum. Retrieved 10 January 2018. Perren, Brian (October 1988). "Class 91 + Mk 4s = IC225". Rail Magazine. No. 85. EMAP National Publications. pp. 28–34. ISSN 0953-4563. OCLC 49953699. This page was last edited on 30 December 2018, at 23:50 (UTC).